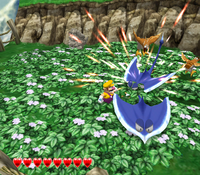 Land Manta Ray are enemies that appear in Wario World. They are manta rays but "swim" in tall grass in Beanstalk Way. They attempt to attack Wario by dashing towards him. They "swim" very close to the ground so they can only be hit by a Ground Pound or Wild Swing-Ding. After three Ground Pounds, they are stunned, allowing Wario to use a Mad Move of his choice. However, Ground Pounding is dangerous in areas that they appear, as missing will result in Wario getting stuck in the grass for a few seconds. Big Scorpers behave similarly to Land Manta Rays. This page was last edited on February 23, 2018, at 20:45.